Now is the perfect time to join Grimsby Golf Club as a Social Member! Click the image to download our Social Membership Application Form! We are now inviting more entries into our Member's Monthly Draw! If you would like a chance to win one of three prizes (£100, £75 and £25) then simply get in touch with our Club Office staff. We have a really busy social calendar in 2019. Click the image to see download and view our calendar. Sunday Lunches from Sunday 3rd March. Enjoy a roast dinner with your friends and family here in our beautiful clubhouse with breath taking panoramic views onto the parkland golf course. Bookings essential. 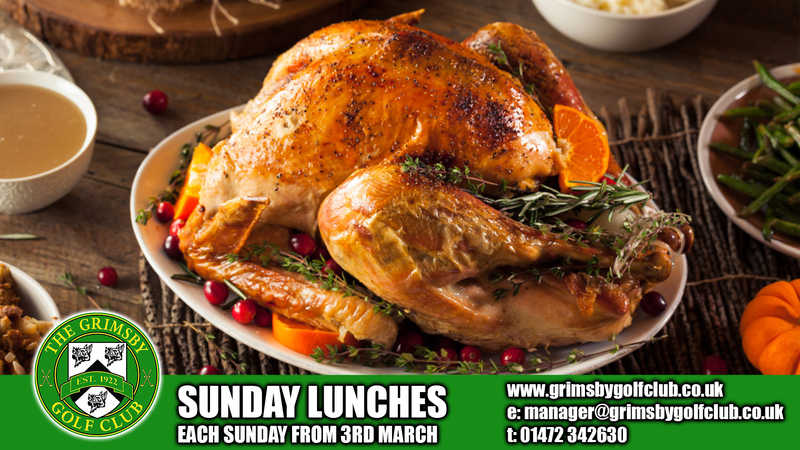 Reserve a table today 01472 267727 or email catering@grimsbygolfclub.co.uk. Bookings are now being taken for Easter Sunday Lunch on Sunday 21st April 2019. Come along and enjoy your Easter Sunday with your friends and family here in our beautiful clubhouse with breath taking panoramic views onto the parkland golf course. Click the image to see the menu. Paul Grant Reason as George Michael is coming to Grimsby Golf Club on Saturday 27th April 2019. Basket meals will be available on the night at a price of £5. Tickets are £14, Member tickets available at £8 each. In 2018 we launched a number of Soul & Motown Nights which were incredibly popular. We have three taking place in 2019 with this being the second event. Rolling back the years to the days of Soul & Motown, get your dancing shoes on and come along for a brilliant and enjoyable evening. David Springfield as Rod Stewart is coming to Grimsby Golf Club on Saturday 1st June 2019. Rolling back the years to the 1980's, on Saturday 15th June 2019 we are having a sensational 80's disco night. Duran Duran, Michael Jackson, Spandau Ballet, Wham and many many more! Bookings are now being taken for Father's Day Sunday Lunch on Sunday 16th June 2019. Come along and treat your dad to a well deserved Sunday Lunch along with your family here in our beautiful clubhouse with breath taking panoramic views onto the parkland golf course. Gary Setterfield as Elton John is coming to Grimsby Golf Club on Friday 28th June 2019. Our Elton John Tribute is by Gary Setterfield on Friday 28th June 2019. In 2018 we launched a number of Soul & Motown Nights which were incredibly popular. We have three taking place in 2019 with this being the third event. Rolling back the years to the days of Soul & Motown, get your dancing shoes on and come along for a brilliant and enjoyable evening. Tony Lewis as Robbie WIlliams is coming to Grimsby Golf Club on Friday 28th June 2019. Madonna is the undisputed Queen of pop, having dominated the charts in the 1980's and continuing to have hit current albums. "Madonna - The Tribute" is a fantastic step back in time to those 80's big hair, rara skirt wearing days, bringing you the most memorable hits. Kylie A Like has been one of the leading tribute shows in the UK and Europe since its humble beginnings in 2001. Now in its 14th year, this well establish show continues to be one of the top Kylie Minogue shows in the world. Having a voice which is impossible to tell apart from Miss Minogue herself, Suzy also has an uncanny physical resemblance, as well as amazing custom made costumes. As a devout Kylie fan, Suzy has carefully crafted her act and mimics the pop princess to perfection. Tickets are £14 or member tickets at £8 each will be available soon. Laura Tapp is coming to Grimsby Golf Club on Friday 22nd November 2019. Laura is without doubt one of the very best Pink tribute acts in the country and has performed his spectacular show around the country. Basket meals are available on the night. Tickets are £16, Member tickets available at £10 each. Quo-incidence are coming to Grimsby Golf Club to perform their incredible tribute to Status Quo on Saturday 30th November 2019. Basket meals will be available on the night. The Children's Christmas Party 2019 will take place on Sunday 1st December from 3pm to 6pm. Tickets will be £8 for children of the age of 2 and over. Tickets for under 2 year olds will be £6. Kirk Johnstone is coming to Grimsby Golf Club on Friday 20th December 2019. Kirk is without doubt one of the very best Olly Murs tribute acts in the country and has performed his spectacular show around the country. This event is available for small and large groups and is perfect for Christmas Party celebrations. Memphis Flash is coming back to Grimsby Golf Club on Saturday 21st December 2019. Memphis Flash is without doubt one of the very best Elvis tribute acts in the country and has performed his spectacular show around the country.